Nestled among the blooming azaleas and dazzling dogwoods of East Texas resides a place where unparalleled history and breathtaking natural beauty combine to create a town unlike any other. This is Nacogdoches, the Oldest Town in Texas that was once the stomping grounds of heroes of the Lone Star State. Today, it’s a lively college town with much to offer if you enjoy the outdoors and the finer things in life. Stroll the brick streets of the downtown square as you browse shops and dine at one-of-a-kind restaurants, step back into the past, and savor all the genteel small-town charm of this Piney Woods destination. Nacogdoches is called the Oldest Town in Texas for a reason. The town as we know it today was founded by Spanish settlers in 1779, yet this part of East Texas has been populated for far longer. More than 1,200 years ago, the Caddo Indians (the most advanced known civilization in pre-historic Texas) established a community in the area, the likes of which you can see at Caddo Mounds State Historic Site. Some of the events of the Texas Revolution played out in Nacogdoches as well, with the tales of heroic deeds retold at places like the Charles Bright Visitor Center and the Stone Fort Museum. Visit the Oak Grove Cemetery to pay your respects to the heroes and statesmen of the Republic of Texas, including four signers of the Texas Declaration of Independence. Visit Nacogdoches in the spring or fall and you’ll be treated to another kind of Texan treat. 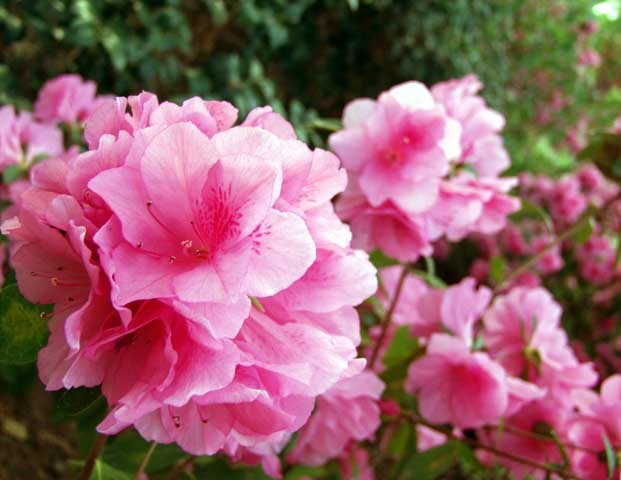 In the spring, thousands of blooming azaleas paint the city in vibrant shades of pink. While you may see these just about anywhere in town, there are a few spots you won’t want to miss. After all, Nacogdoches is also the official Garden Capital of Texas. The Ruby M. Mize Azalea Garden houses more than 7,000 azaleas across eight forested acres, making it the largest garden of its kind in the state. Three other arboretums and plant centers covering more than 60 acres reside nearby, giving you the chance to stop and smell the flowers. In addition to its gardens, Nacogdoches has three hiking and biking trails that provide a great way to escape to nature. Although they’re open year-round, fall is a particularly spectacular time to explore these pathways as the leaves of the dogwood, hickory, and paw paw trees turn brilliant shades of orange, red, and yellow. The longest of these is the 5.89-mile Lanana Creek Trail, an old Indian footpath that runs a few blocks east of downtown to Stephen F. Austin State University. Nacogdoches’ verdant forests provide a tantalizing backdrop for golf. Woodland Hills Golf Club offers 18 holes of challenging golf that includes tree-lined fairways and devious sand and water traps. Yet it is also one of the very few places in Texas you can play a new take on the sport: footgolf. Kick your No. 5 soccer ball through the course and sink your “putt” in each hole’s special 21-inch-in-diameter cup as you try to get the lowest score, just like in traditional golf. The allure of its historic sites and natural beauty is more than enough reason to visit Nacogdoches, but there’s more to this Texan town. Take your time hunting for treasures in the antique and specialty shops and browse the art galleries found in downtown Nacogdoches. Sit down for a delicious meal at a local eatery, catch a show at one of the live entertainment venues, and admire all the beautifully resorted old-fashioned storefronts. To get a true taste of Nacogdoches and East Texas, check out all the fresh produce, locally made dairy, and other products at the Nacogdoches Farmers Market, open every Saturday. There’s plenty more going on throughout the year in Nacogdoches, starting in January with the Old-Fashioned Sugar Cane Event and continuing on with a film festival, a downtown wine swirl, and a half marathon. 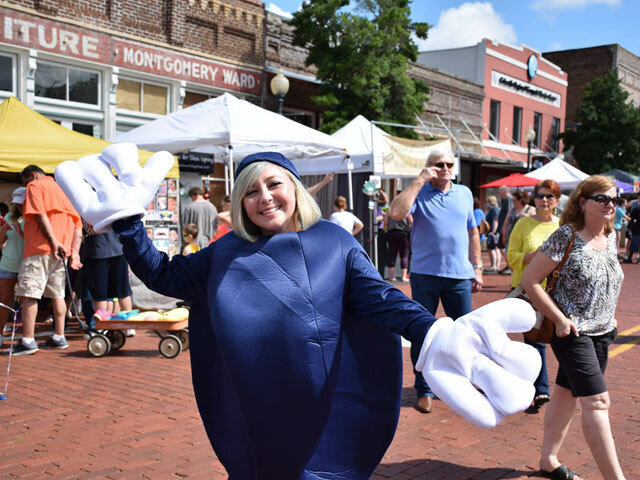 One of its biggest events, the Texas Blueberry Festival, attracts thousands to downtown Nacogdoches to celebrate the annual blueberry harvest with live music, games, and delicious food. With its charming historic downtown area, fascinating historical sites, laid-back small-town feel, and natural beauty, Nacogdoches is a 300-year-old legend that must be seen to be believed. Plan your next trip here to see where Texas started.